BEIJING－As the year 2017 draws to a close, there is no doubt that China will meet its economic growth target of 6.5 percent. Reaching this position has not been easy as the country is undergoing a massive transformation toward quality growth. Doomsayers overseas warned that the Chinese economy may unravel as early as February, citing a growth in bad loans coupled with slowing growth. So, why has the world’s second-largest economy fared better than expected? Here are “four Rs” that offer a glimpse into China’s progress in what has been a tough year. Despite some short-term fluctuations, the economy continued firm growth with GDP expanding 6.9 percent year-on-year in the first three quarters. The job market is stable with registered unemployment in Chinese cities standing at 3.95 percent at the end of the third quarter, the lowest level since 2008. Nearly 12 million new jobs were created in cities during January-October, exceeding the annual target of 11 million. The Consumer Price Index growth stood at 1.5 percent compared with a year ago in the first 10 months, well below the target of 3 percent. Resilience in the less developed northeastern rust belt has also improved, thanks to the establishment of the Liaoning Free Trade Zone which allows old industrial cities to attract more investment, take advantage of the Belt and Road Initiative, and explore economic cooperation with Northeast Asia and Europe. Yingkou, the first treaty port in Northeast China that opened to foreigners in 1861, now has re-emerged in the spotlight having attracted foreign investment of 21.26 billion yuan (about $3.2 billion) since becoming part of the free trade zone in April. China has started serious rebalancing by cutting excess capacity in the steel and coal sectors, where it has the highest output in the world. Despite the challenge of job losses and re-employment, China has already met the year’s capacity reduction target. As a result, its industrial capacity utilization rose to the highest level in five years, reaching 76.6 percent from January to September. HBIS Group, the largest steel company in the Beijing-Tianjin-Hebei region, saw its net profit rise by over 74 percent in the first half of this year. Another key measure of rebalancing is destocking. The property sector, an industry with a high inventory, saw over 602 million square meters of property unsold by the end of September, down by nearly 9 million square meters from a month earlier. Instead of heavily relying on foreign trade and investment, the Chinese economy has drawn more strength from consumption, services and innovation. The services sector expanded 7.8 percent year-on-year in the first three quarters, compared to 3.7 percent in the primary industry and 6.3 percent in secondary industry, contributing 58.8 percent to the economic growth. 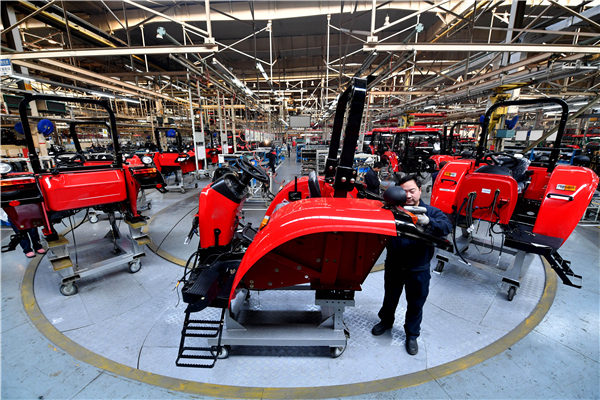 The high-tech and equipment manufacturing sectors also became stronger and attracted more investment. From January to September, investment in the high-tech industry rose by 18.4 percent year-on-year, compared to 11.7 percent a year earlier. The broader use of robots indicates that China’s manufacturing is getting smarter. As of October, the output of industrial robots soared by 68.9 percent, amid fast growth of AI technology. Leading Chinese AI company iFlytek has dedicated research to intelligent speech and language technologies, and won nearly 70 percent of the global Chinese language recognition market. A robot, codeveloped by iFlytek and Tsinghua University, achieved a score of 456 in the written test for the national doctor qualification, higher than the national pass line of 360. As the AI era approaches, the Chinese government is encouraging private enterprises to enter sectors like smart manufacturing to improve the country’s high-end manufacturing. New industry standards and specifications are to be established. Backed by better-than-expected growth, the International Monetary Fund has revised up its forecast for the fourth time this year, to 6.8 percent this year and 6.5 percent next. Chi Fulin, head of the China Institute for Reform and Development, has predicted annual growth of at least 6 percent in the next five years.